A few months before we married, Bo & I bought a new mattress and a suite of bedroom furniture. It wasn't fancy, but we did splurge on the more expensive mattress. We bought a bed frame, a dresser and an armoire of sturdy pine. And a mattress that I was afraid to lay on at first because I didn't want to like it because of what it cost. As so often happens, my dear husband encouraged me. I laid down and knew that we had to spend the extra money for that mattress. That was more than 12 years ago. We began our married life in that bed. We conceived all our babies in that bed (sorry if that's TMI). My water broke in November 2000 in that bed. I practically lived in that bed nursing my oldest the first few months after his birth. I went into labor in May of 2002 in that bed -- 4 weeks early. And nursed and co-slept with another babe. I grieved my miscarriage in that bed. And spent the last few weeks on bedrest in April 2009 in that bed before Lydia joined our family. And, once again, I spent many many hours nursing a new babe in that bed. 12 wonderful years of secrets and love and sleep and nursing and tv-watching and snuggling. 12 wonderful years of expectations and new beginnings. And, last Friday, that mattress headed out my door for donation. A brand new, soft, luxurious, king-sized bed took its place. I hold the memories in my heart, but that bed represented the last 12 years of my life in many ways. I was sad to see it go. Until I sank into the soft comfort of our new bed. And knew that I was ready for another decade of expectations and new beginnings. Crushed Ice Makes My Day! 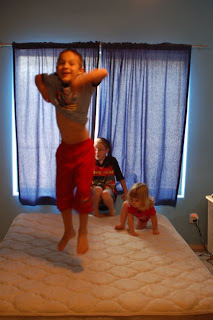 Do You Jump on Your Bed?